I’ve been slacking on my ‘Crafty List of Things to Do‘, so I finally decided to tackle one of the easier projects. 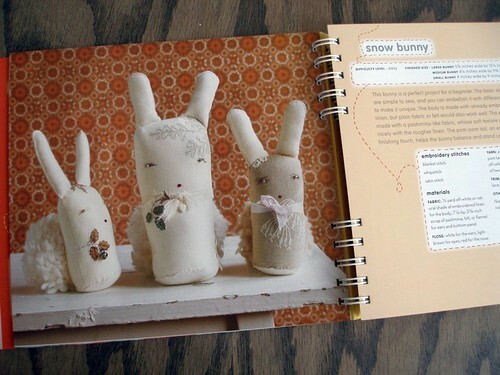 There are so many great patterns in the ‘Softies‘ book, but of course, the sweet Snow Bunny caught my eye. My bunny collection is coming along nicely. Thank you for asking. I’ll do a group shot of my bunny family soon, if I can get them all in one place at the same time. 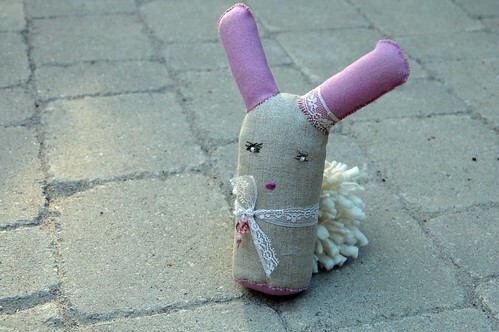 Snow Bunny was designed by one of my favourite softie designers Tamar Mogendorff. The construction is quite simple and I enjoyed all the hand stitching. 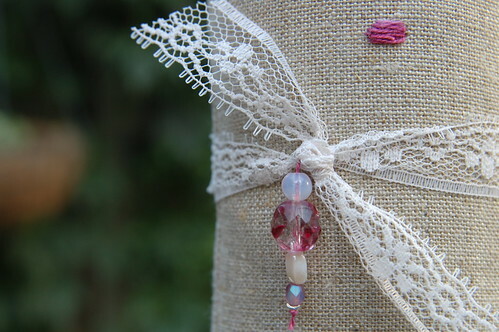 I was quite inspired by Tamar’s embellishing and pretty much tried to replicate it as best I could. I was happy that I hadn’t gotten rid of my bead collection so that I could give the Snow Bunny a little ‘bling’. She’s a pretty posh bunny. For the pom pom tail, Debbie donated some gorgeous, chunky cream yarn from her extensive stash to the cause. I took this opportunity to try out the Clover Extra Large Pom Pom maker. It was easy and fun. I wanted to make more, but what else can I make with pom poms? I used the same wool stuffing we use in the Animal Softies class for filling. I will never use anything else. It feels so wonderful, it molds nicely and feels slightly heavy. 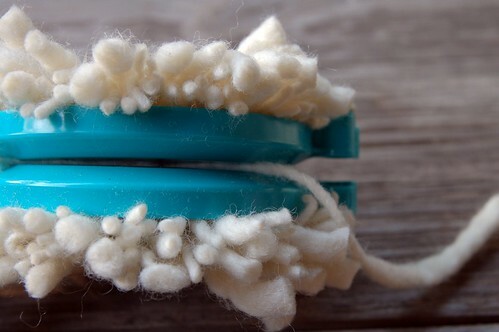 The wool will also deter dust mites and mold. 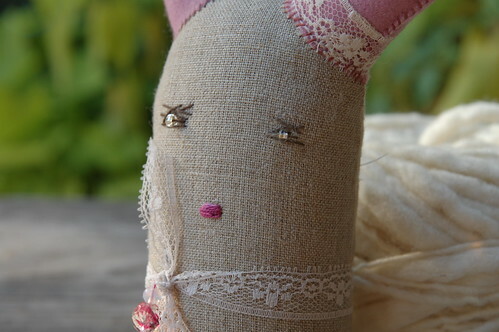 Plus, if you’re making dolls for children or babies, the wool will retain familiar scents that can be very comforting. the workroom received oodles of new books and patterns this week, so I’ll be updating My Crafty List over the weekend with some new projects. Baby Stuff by Aronzi Aronzo has some definite bunny possibilities! Laughing at the tail…it is so funny. And great. She looks really lovely. So adorable and pretty. She is, quite simply, lovely. I really like the tail and the very gorgeous necklace. She looks as though she is getting ready for a date. Perhaps with Chuck? i love her! she’s perfect. 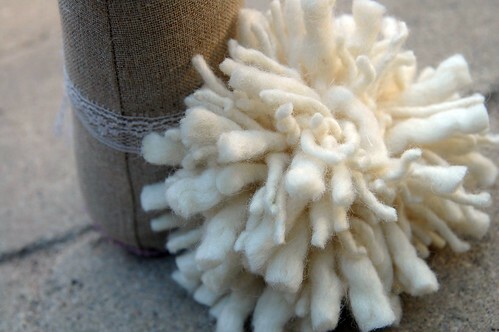 do you have the pompom makers in the store? I was JUST saying this morning that I need a pompom maker.